New year, new look for Sally Beauty Supply's exclusive brand FingerPaints. They've redesigned their logo, revamped their core line and its display, and come out with new flakie toppers! (And they're BOGO FREE through 2/27 with code 555209! All polish except OPI is included in this sale.) This new logo doesn't seem to detach from the bottle like the old one, which should be as much of a relief to my fellow clearance shoppers as it is to me. No more bargain bottles that wind up saying "Fin Pai" or "er ts" or get stripped completely bare. That always bugged me. Anyway...my ears perked up when I heard that they'd put out more flakies. Their Special Effects collection has become legendary and I almost cried when I completed my set. Every flakie lover got their hopes up, but a lot were disappointed to find out that these aren't as big or as bold as the first bunch. I wasn't daunted. I had one of my hunches. They looked...familiar. I went out and bought all five, with comparisons buzzing in the back of my mind. Swatches first though! note- I don't have much to say as far as reviews go, since they're all in the same clear base. They apply pretty smoothly and evenly, but you may want to touch up little spots here and there if you're only doing one coat. All swatches are one coat over a cream and finished with two coats of NYC Grand Central Station. I've read several reviews that called the base milky or cloudy. This effect goes away completely with top coat. Symmetrical Symphony has an assortment of flakes in blue, green, peach, and more. Sure, they don't have the same impact as the Special Effects collection, but....I like them! Instead of fiery opals, these look like tiny shards of glass. They're a bit bolder when mattified. In Symmetrical Symphony, mattifying really brings out the orange and blue and tones the other colors down a bit. Abstract Attraction has flakes in blue and purple, with a hint of green and pink. Though they pop more when they're over a very dark base, I might like them even more over a base closer to the color of the flakes. The result looks like gemstones. Layering like this also highlights the occasional bits of other colors in these blends. I mattified this combo too and it also gets bolder this way. Psychedelic Hue's flakes are blue and soft blue-green, with dashes of purple and soft yellow. What's true of the combo above is even truer this time. My eyes were drawn right to the tiny specks of purple. I've rarely been so tempted to make polish jewelry as I am when I look at this. I love it even more when it's mattified! See what I mean about the overlap and interplay of the flakes? Vivid Reflection has mostly fuchsia and peach flakes, with touches of cobalt, green, and pink. I had a tough time finding a base for Vivid Reflection. The flakes almost clash with each other. I like how it looks over Zoya Casey's deep maroon, but I feel like it's better over black and might look amazing over brown. Mattifying improves this combo too, of course. Colorful Dream has a variety of pastel flakes. Am I nuts or are the flakes in Colorful Dream considerably smaller than in the others? I sorta feel like all of the tiny background flakes from those were gathered together for this one. While it and Symmetrical Symphony are both assortments, they're fairly different. Colorful Dream leans more toward soft purple, blue, and green. Symmetrical Symphony is heavier on orange and cobalt and looks bolder. This is quite soft and tranquil. Mattified, it reminds me of a countertop. That's not a bad thing. Dead ringer, no? Orly Green Flakie TC has very slightly denser flakes than Abstract Attraction, but otherwise? Dupes! Pink Flakie TC was a little tougher to peg, but I found two possible contenders. Vivid Reflection isn't as similar as I'd guessed, but Symmetrical Symphony is a perfect dupe. 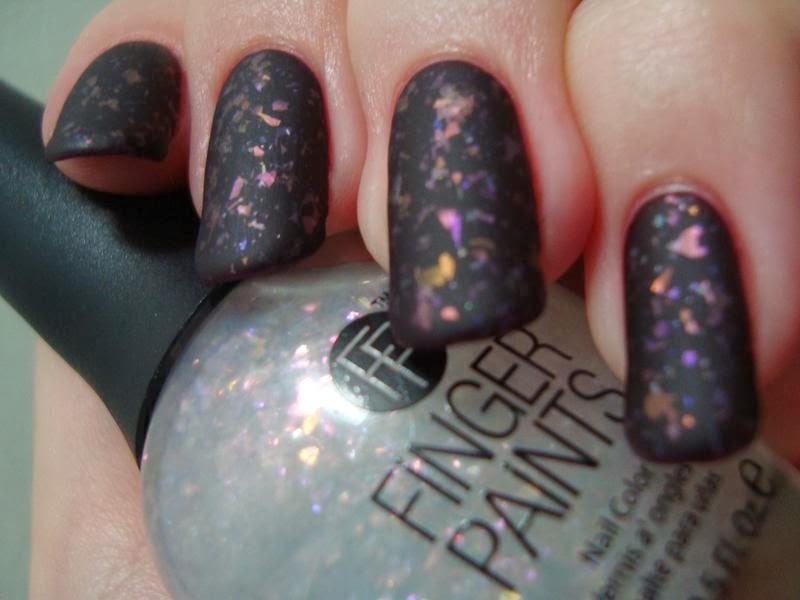 Bottom line: So did you notice that while I called the Orly Matte FX flakies "shards", I called these "flakes"? It's a fine line and the base on these is better than the Orly base, so they're tamer and easier to apply. They don't do any of the foldy or pokey nonsense that shards do, but they're right on that line. Do you need these new FingerPaints flards....or...uh....shakies? If you have the Orly Matte FX ones, you can easily skip Symmetrical Symphony and Abstract Attraction. If you didn't like the Orlys, you can probably pass on these altogether, since they're variations on the same look. If you liked the look of the Orlys, but not their formula, these are better. Since these are LE, I'm not sure how easy they'll be to find. I'm tempted to say that since they don't look like much in the bottle, they might not sell well. But then you really never know, and they've been out for long enough that I hesitated before tagging them as new. I finally found these today! I'm so excited to wear them!